This paper shows steps for silicon nanowires substrates synthesis in detail. The research is focused on experimental techniques optimization while the targeted application was a fabrication of highly sensitive substrates for surface-enhanced Raman spectroscopy (SERS). 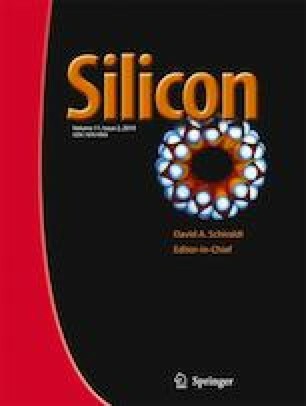 Horizontal silicon nanowires on top of two-inch wafers were obtained by vapour-liquid-solid growth inside the low-pressure chemical vapour deposition reaction tube. The silicon nanowires morphology was monitored by scanning electron microscope after a short and long growth period which defined an adequate deposition time for SERS applications. Surface-enhanced Raman spectroscopy features were tested on silver nanoparticles decorated substrates and the detection concentration limit of 10− 9 M of rhodamine 6G molecules was reached. Raman spectroscopy showed that the 532 nm laser excitation powers of less than 4 mW (∼0.57 kW/cm2) do not widen the phonon peak or shift its frequency and the nanostructure distribution parameter of 3.7 nm was calculated. The horizontally placed Ag decorated nanowires are proved to be sensitive substrates for surface-enhanced Raman spectroscopy only if the silicon nanowires thickness, length, volume density as well as metal nanoparticle size and distribution are carefully designed. The authors would like to thank ‘Zaklada hrvatske akademije znanosti i umjetnosti’ for the financial support in the frame of the project ‘Površinski pojačano Ramanovo raspršenje za razvoj biokemijskih senzora, 2015’. This work has been partially supported by SAFU, project263 KK.01.1.1.01.0001., and by Croatian Science Foundation under the project (IP-2014-09-7046).